Back of SkunkGurl, Southy's mine. Ahhh gee - thanks Queenie, I feel so much better now. But never near as good as travel with The Skunk. Better luck next time Southy. Awww, Sweet and Sour, how fitting. Umm, we're still on for Omak right Cats? All joking aside, how does February 17th sound? I see that I may have to turn my back on you (!) as reprimand for scooping Southy from my grasp, this time. 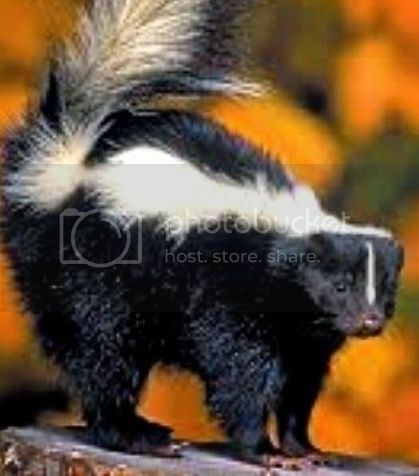 It is rumoured that he has plenty of cash (allergic to cathair) and needs attractive female companionship for travels abroad, and Skunk fills the bill. Yes, Feb 17 looks ok right now. Where, Vernon, Kelowna, ports in between? Who likes what place and why? Kiki Gardens for sure. Lots of selection! not a fan of Asian Avenue myself. Far less selection. I believe it's going to be Kiki Gardens, unless they are closed on Sundays too. Glacier, you recommended it but I realize you aren't downtown on weekends as easily as on your work days. Can you make it anyways? Yellow balloon necessary this time? I'm pretty busy most days and nights. Cutting it really close to V-day means the restaurants will be packed. Are you suggesting most Vernon husbands will forget and scramble to take their darlin's out AFTER V-Day? Gotta be there Glacier as you make such wonderful "after party" videos but this time, Skunk will be in starring role. Right? Queen K wrote: I believe it's going to be Kiki Gardens, unless they are closed on Sundays too. We need a new place. OKkayak wrote: I quite like Royal Garden up by the Casino. Asian Avenue (formerly Yat Sen) by Denny's is pretty good as well. Okay, Royal Gardens it is. We will do our level best to make sure you aren't roadkill on the buffet quest. And you need to ask me why I'm going to China …..